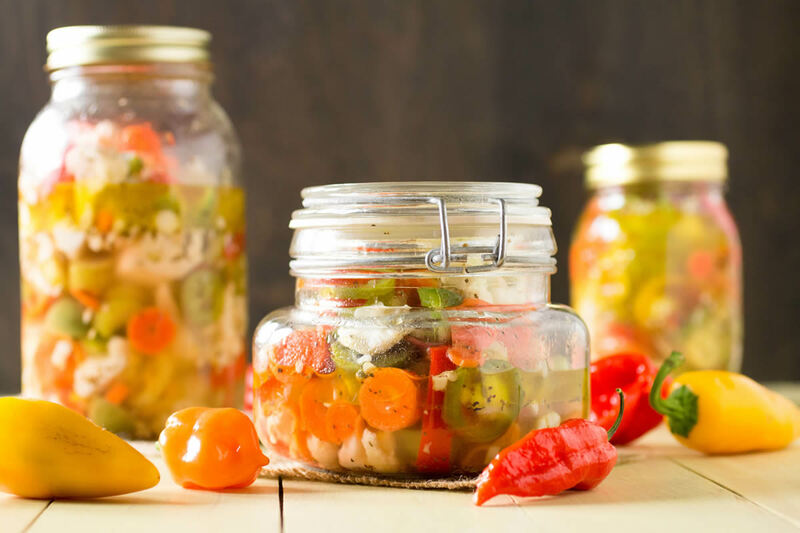 Make your own giardiniera at home with this extra spicy recipe. I used a variety of peppers, including jalapenos, 7-pots, ghost peppers, jaloros, habaneros and Italian sweets, plus so much more. The garden is officially over. Booo! Truthfully, we had an incredibly productive season, yielding MANY LOADS of chili peppers and tomatoes this year. We were both suprised and excited by the amount produced. I finally just yesterday pulled the remaining pepper plants from the ground and gathered another 8 pounds of peppers or so. I will be chopping and freezing some (see How to Freeze Chili Peppers), dehydrating several more (see Dehydrating Chili Peppers), and cooking in general, but here is another one of my very favorite ways to use up a big batch of peppers in order to keep them longer. Giardiniera is a wonder condiment, and it is an absolute MUST if you live in or near Chicago. Or anywhere else, for that matter. 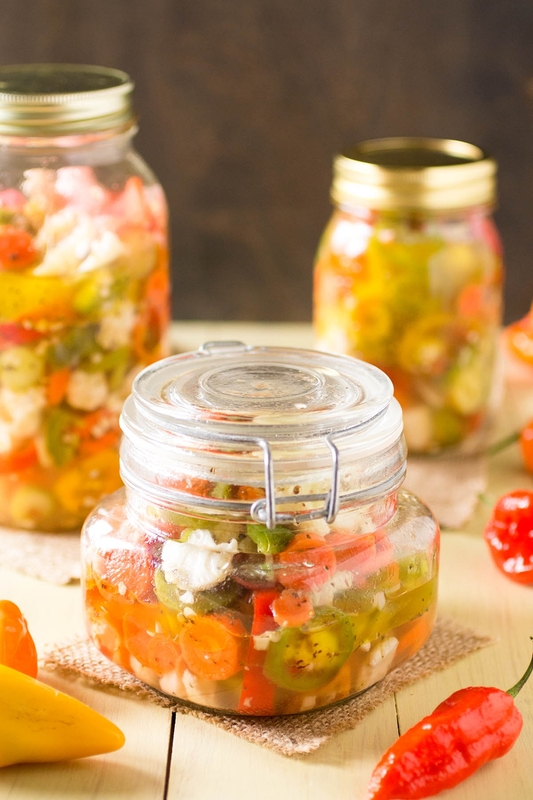 This is a variation of our popular Homemade Chicago-Style Giardiniera Recipe. 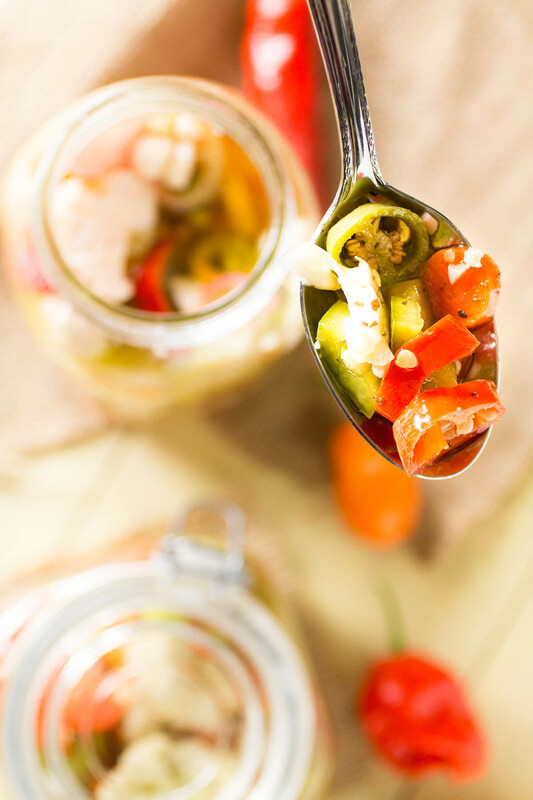 Breaking it down, giardiniera is essentially a mixture of chopped peppers and other vegetables preserved with a simple vinaigrette. It is traditionally made with Italian style ingredients, but this version brings in a big variety of chili peppers from our garden, including jalapenos, 7-pots, ghost peppers, jaloros, habaneros and Italian sweets, along with some chosen vegetable additions, including carrots, radishes, celery, cauliflower, garlic, and some seasonings. The reality is, you can make this with whatever chili peppers and vegetables you prefer, as long as they are firm and won’t fall apart in the resulting mixture. Time to get creative, my friends. This particular version is will quite hot, though! particularly with the ghost peppers and even hotter 7-pots. Oh baby! Be warned. Then be satisfied. Your spicy crave demands it. What do you do with Giardiniera, you ask? Anything! It’s great on sandwiches, when used as a condiment, particularly on beef sandwiches. Serve it with a big bowl of chili. Top pizza. Go nuts! I hope you enjoy it! To a large bowl, add all of the peppers with radishes, carrot, celery and cauliflower. Sprinkle with salt. Cover with water and refrigerate for 12 hours, covered. Drain and rinse away the brine. Set aside. In a separate bowl, add garlic, basil, celery seed and ground pepper to taste. Add vinegar and oil and whisk to combine. Add to your vegetable mixture. Place it all into jars, ensuring the vegetables are covered with your vinegar/oil mixture. Refrigerate at least 2 days before using, to allow flavors to mingle. A week is better! Should last you 2-3 weeks. Three weeks ago, I used this year last chili peppers harvest for this giardiera: jalapeño, serrano, pequin, Bishop’s crown, Habanero, rocoto etc. And I’m enjoying now it in a very simple sandwich (pita, bacon, cheddar, mayo). Thanks, Jeremie. I do love my giardiniera! Spicy and crunchy, perfect for a sandwich. This looks awesome! I’m definitely making something similar. I plan on fermenting it. What is your reason for recommending against fresh basil? Would you apply that to other fresh leafy ingredients for seasoning? Jason, you can use fresh, and the flavor will be there, but I fee fresh herbs get soft in the oils if you don’t chop it enough and battles the texture of the other elements. Give it a try and let me know how it turns out for you. Thanks Mike. Sorry for the double posts. When I refreshed the page to see if you or anyone else had replied I didn’t see my comment and thought there was a problem with my browser or it got omitted as spam. All good, Jason! I hope it turns out how you like it! Why would you not use fresh herbs in this? You can use fresh herbs, Jason, though fresh herbs in oil tend to get a soggy texture and discolor sometimes. The dried herbs will still hold the flavor you’re looking for. Can I can in a hot water bath ?? Sandy, yes, you can. Absolutely. However, check the acidity. If is higher than 4.0, you’d want to use a pressure canner. So I am a old male that doesn’t cook, but can follow simple directions? sometimes! How many jars, of what size, does this make? Doesn’t the olive oil harden in the fridge? 1/2 cup salt, table salt or coarse sea salt? EVOO ? Can I use fresh Basil? Hibbie, this should make you a couple large quart sized jars. I would use dried basil here, not fresh. I use coarse sea salt, though table salt is fine. The mixture does thicken up a little in the fridge. I hope this helps. Do you know if you could leave out the olive oil or maybe put one forth cup in the giardiniera? Sandy, yes, you can reduce the oil if it is not to your tastes. Focus on the vinegar. It won’t taste quite the same, but should be some nice lightly pickled veggies. Let me know how it turns out for you. Can I use frozen chili peppers for this giardiniera recipe or might they be too soft after they’re defrosted? Andrea, I’ve never made this with frozen peppers. I’m pretty sure you’d be able to do it, though. The peppers might be a bit softer than you’d get with fresh pods, but I think you’ll still get the proper flavors. Let me know how it turns out for you. Mike, turned out great. Thanks for another great recipe! That’s GREAT, Andrea! Thanks for letting me know! I LOVE my giardiniera.